This year’s theme is Strengthen your defense! #GetVax #VaccinesWork. Expanded Programme on Immunization (EPI) Manager, Ms. Marina Bedeau said the aim is to let the community know that vaccines are important, as they protect children and adults from serious illness caused by diseases such as measles, polio and whooping cough which are preventable by vaccines. “Vaccination is the best way to ensure that your child or children are healthy and protected against preventable diseases,” she said. The EPI Manager is encouraging residents to support the events, and to participate in the educational sessions to learn more about vaccines and their role. “We have a public health responsibility to our communities,” she said. “We want a healthy nation free of diseases that affect our normal way of living. One way to reach this goal is to get your child/children and even yourself vaccinated,” Nurse Bedeau further added. 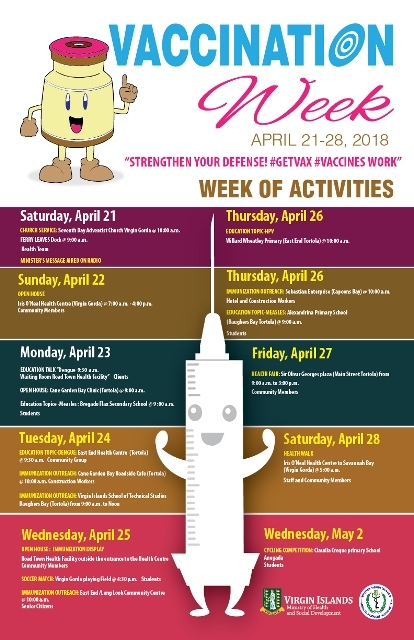 Vaccination Week will be observed from April 21 to 28 and includes an official message from the Minister for Health and Social Development, Honourable Ronnie W. Skelton. Other activities slated for the week are an Open House at the Iris O’Neal, Cane Garden Bay and Road Town Health Centres; Immunization Outreach; Soccer Match and Health Walk on Virgin Gorda; a Cycling Ride-Along Challenge on Anegada; and a Health Fair on Tortola. Vaccination Week in the Americas is an annual public health campaign by member states of the Pan American Health Organisation (PAHO) to promote equity and access to immunizations. It is observed every year during the last week of April.